All good books tell a story that moves or inspires the reader to undertake new activities and Books Beyond Words are no exception. 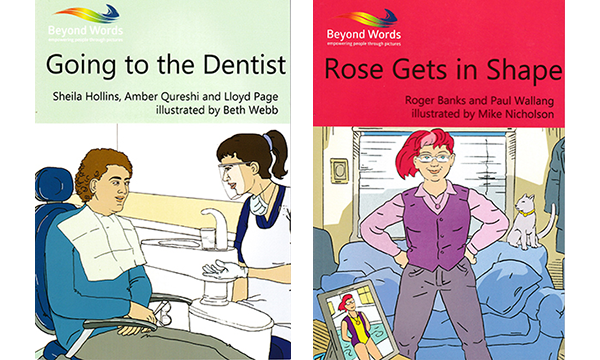 While the NHS England Accessible Information Standard encourages health services to provide information in a way that every individual can understand, Books Beyond Words go one step further. By providing a narrative in pictures only, they allow the reader to synthesise their experience and interpretation, to become the author of the story. These two new editions join more than 50 other books in the series on health and social issues, from making friends to managing long-term health conditions and coming to terms with death. These books provide an excellent resource for health professionals to help and inform patients, particularly people with learning disabilities. In Going to the Dentist, for example, we learn about access to resources such as this can enable better understanding and more informed choices about health. In Rose Gets into shape, a public health message is shared through watching Rose's food intake. Along with these new editions, Books Beyond Words has recently developed an app and is encouraging the development of local book groups to increase the depth of understanding and offering a fun opportunity to meet new people and discuss the books.